I’ve been lusting after the Pelikan M800 Brown Tortoise ever since I’ve laid eyes on one. I love the play of light and dark colours of the brown tortoise shell finish. However the price have always put me off buying one of my own. Maybe Pelikan has heard my prayers and launch the Brown Tortoise in M400 size this year. With a quick check on the price, I promptly ordered one for myself. 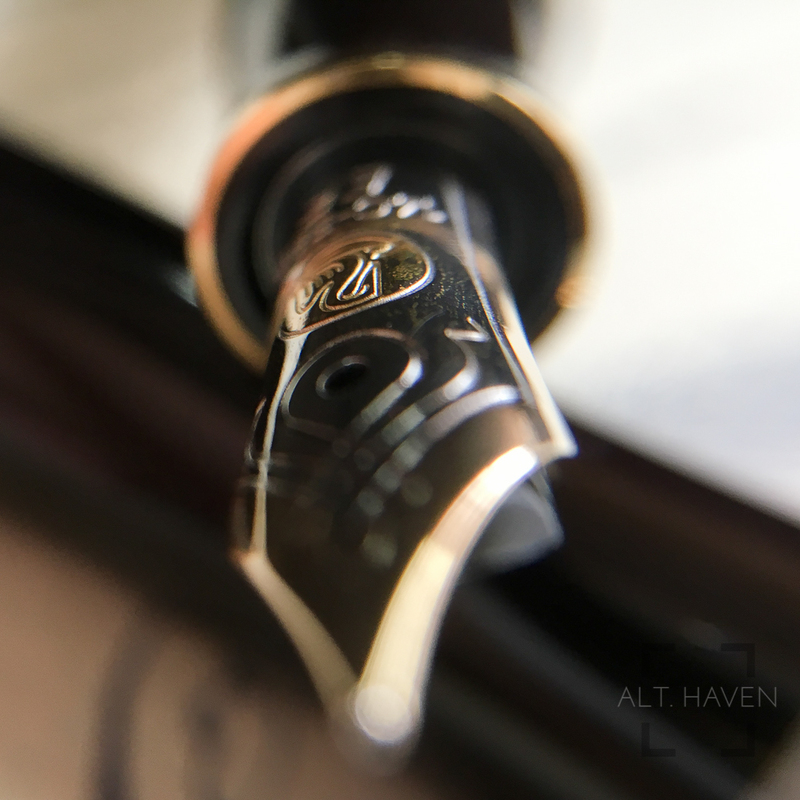 I’ve previously reviewed the M205 and I went into detail about what does the various model number mean in the Pelikan lineup. Do go over there to read about it, I won’t be repeating it here. 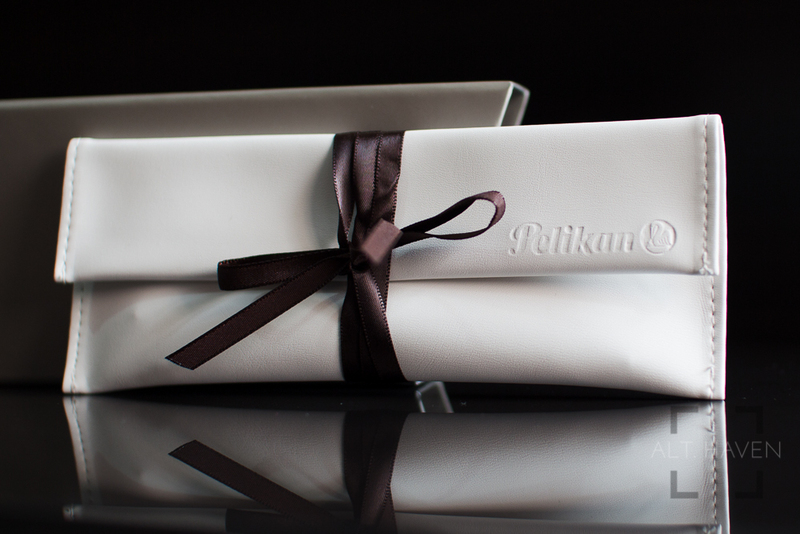 The M400 Brown Tortoise comes in a regular Pelikan box that can be open by pulling on the tab at the side. It also has the standard white faux leather pouch which holds the pen. There wasn’t anything particularly more fancy in terms of the packaging for this special edition fountain pen. The M400 is mostly made of dark brown resin and brown striped cellulose acetate for its barrel. It is accented with double rings of gold around the end of the cap and at the piston knob. The clip and finial is also gold. 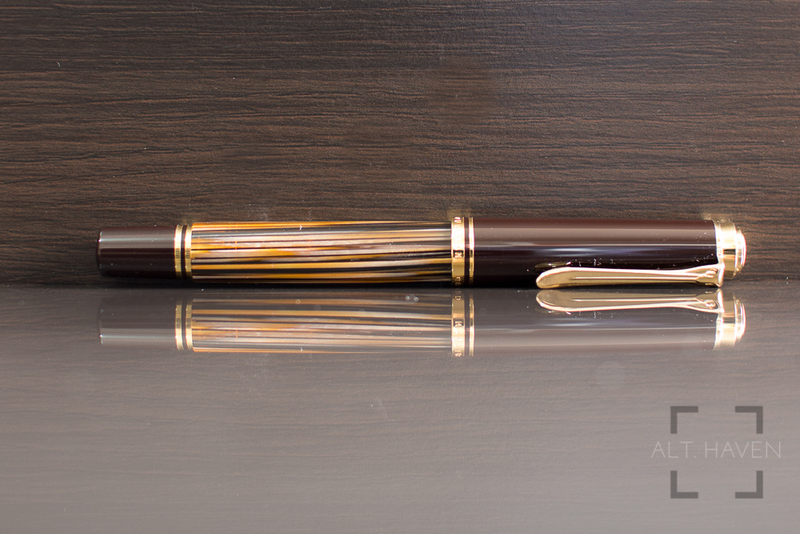 The pen looks very classy but the brown stripe barrel adds a flash of character to the otherwise standard looking Pelikan fountain pen. 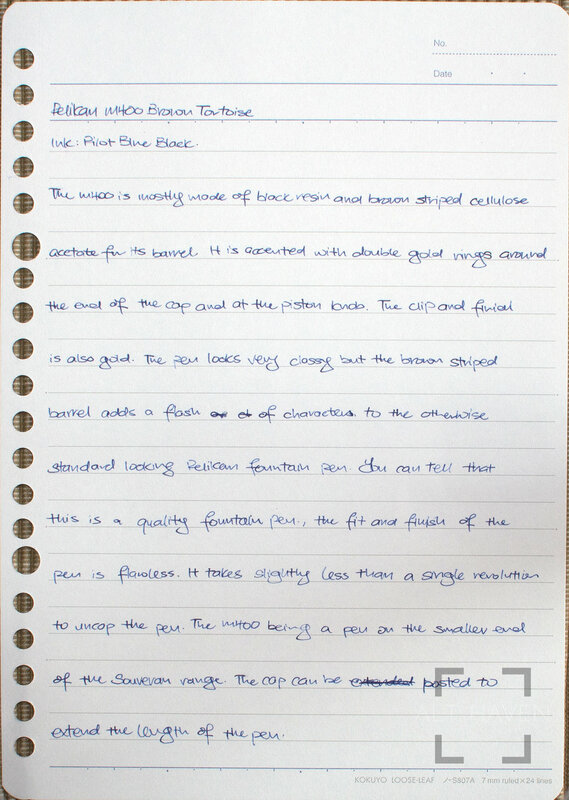 You can tell that this is a quality fountain pen, the fit and finish of the pen is flawless. It takes slightly less than a single revolution to uncap the pen. The M400 being a pen on the smaller end of the Souveran lineup, the cap can be posted to extend the length of the barrel. The cap securely at the end of the barrel. Personally I found it comfortable enough without posting. The grip section is relatively short and thin. I would say the M600 would be a comfortable size for most. Those with larger hands should try it out in person before buying. I had some issues with my M205 previously. Maybe this is a special edition fountain pen or the M400 series generally get better quality control, the threads that I found sharp on the M205 are smooth here. 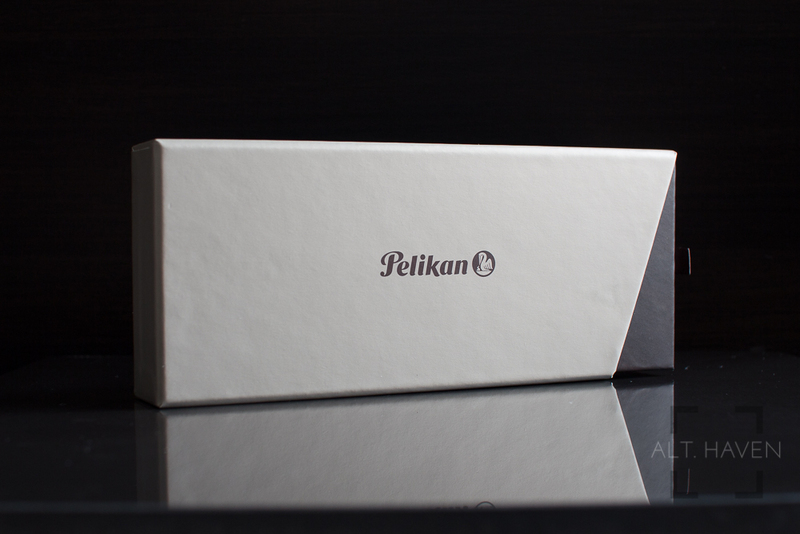 Pelikan Souveran fountain pens are all piston fillers. Thanks to that, they have substantial ink capacity. The resin barrel is clear, while the stripes are opaque. It makes it easy to monitor the ink level of the fountain pen when you looked at it against light. 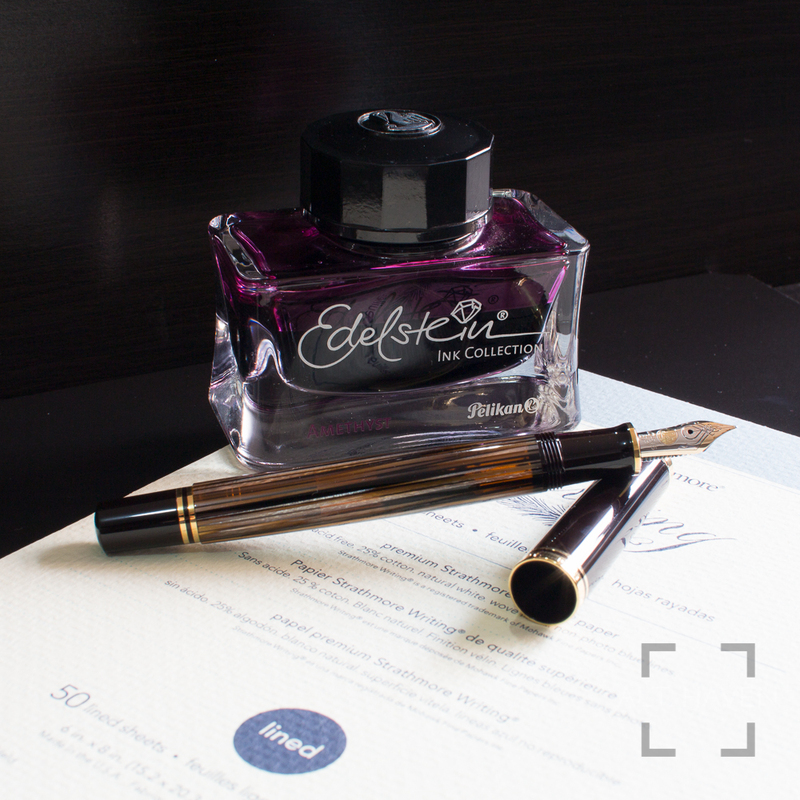 The Pelikan M400 Brown Tortoise comes with a variety of nib options, going from EF to B and special for this particular release an Italic Board nib. Me being me, opted for the EF nib. It wrote well out of the box but personally I found Pelikan nibs does nothing for me. They wrote broader and wetter than usual of their nib size so I promptly handed it off to a local nibmeister to have it ground down into a Japanese EF. The result is a nib with delicious feedback. It writes very finely as expected of a Japanese EF nib. Though this nib wasn’t modded for additional flex, with a little pressure I can get some line variation from the nib. The feedback can be a little much so this particular nib modification isn’t for everyone. The Pelikan Brown Tortoise is one of my grail pen, I “settled” for the smaller sibling but the colour of the light and dark alternating stripes is just as beautiful to admire. Plus, I don’t believe any two Brown Tortoise pen is completely identical because of the stripes. As a standard M400, this isn’t the cheapest model you can find out there, but the Brown Tortoise finish is just too hard to say no to. Though the nib modification is an additional cost but it is also what makes the pen special to me. There are affiliate links in this review. I may get a small amount of store credit if you purchase anything via the link(s). You are under no obligation to do so but if you would like to do something nice, do buy what you need via my links.